Let me start by saying I love me a good mani/pedi. LOVE. This was the first battle I had with my oncologist, one that I fought with him over (and eventually won - I would have to bring my own tools, and no cutting..) But that was also when I lived somewhere that hovered at 67 degrees give or take plus or minus three degrees for the entire year. A mani/pedi is a perfect activity to be lazy and indulgent and supine with friends when it's too cold to lay outside but not quite cold enough to lay inside, possibly in front of movie/fireplace. Then I came to a land that has seasons, and suddenly being inside felt like a terrible idea. Also, I would rather spend my money on plane tickets to visit the aforementioned friends. So, with those two factors - the joy of being outside and the fiscal decision making - I decided that barring very special occasions I would start doing my own nails. 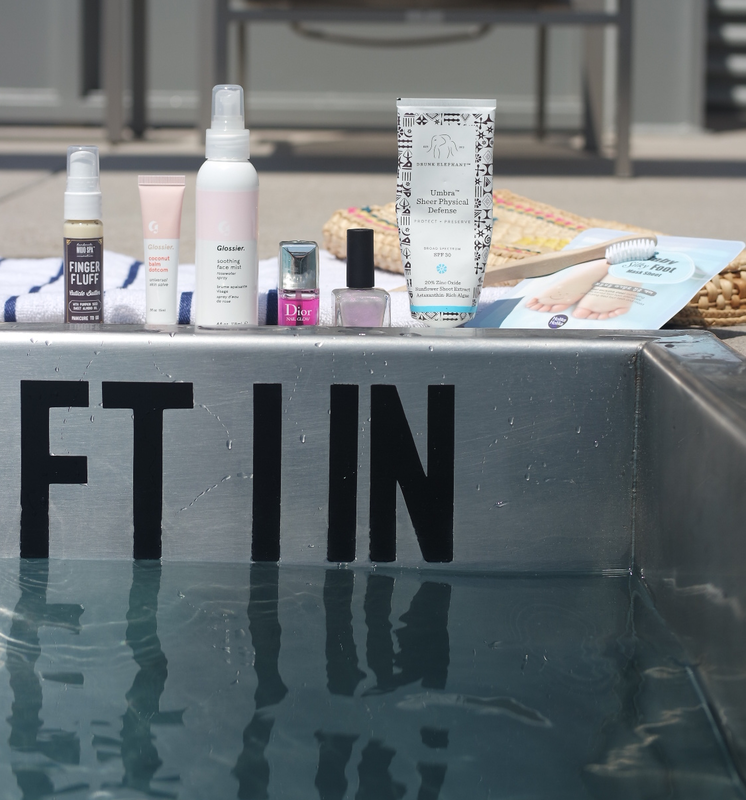 From this the poolside mani/pedi was born. Now, I cannot take credit for this idea. I have a distinct memory of lying poolside with some friends when one reached into her bag and produced some polishes. It was genius. The perfect activity for poolside bonding and conversation. Plus being outside made the nail polish smell my husband so detests a non-issue. But of course I had to take it to the next level. And so my "summer mani/pedi" kit was born. 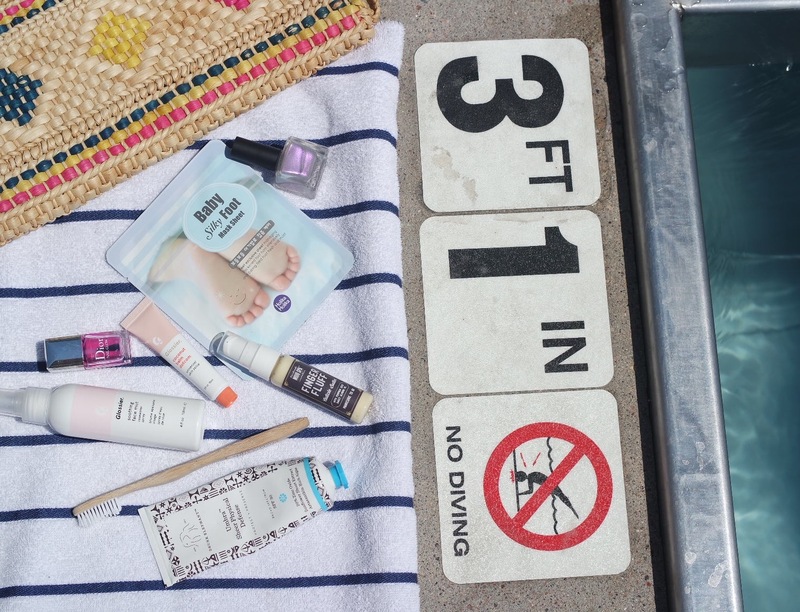 Inside this pouch are the essentials for a poolside (or outdoors of any kind) mini spa indulgence that leaves your hands clean, fresh, pretty and low maintenance. Smudges and chips are non-detectable. It's like a slightly better version of your natural hands and feet. 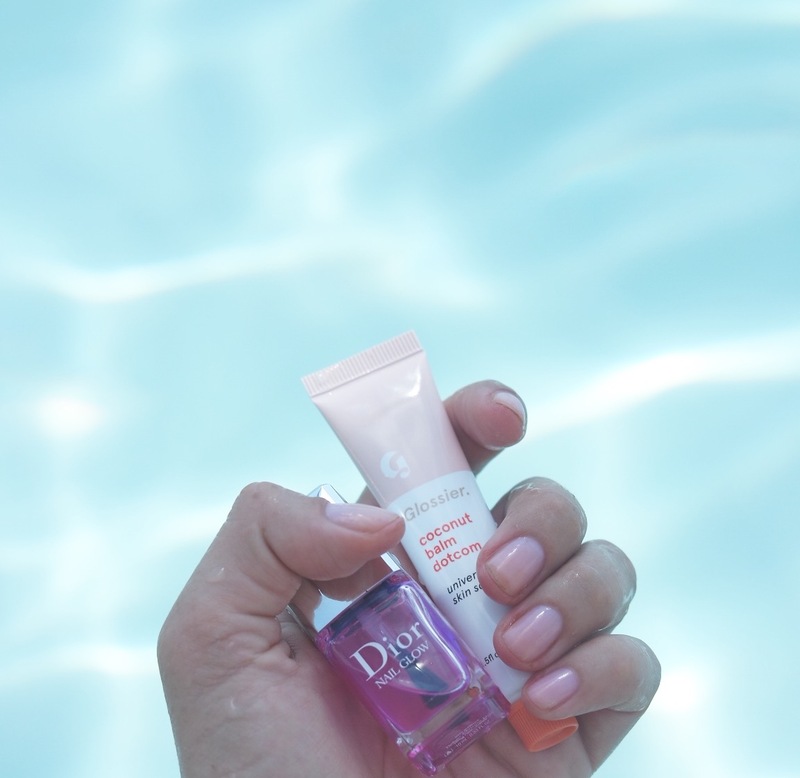 Follow whichever the steps below that tickle your fancy, and you too can have your own DIY summer spa manicure/pedicure. If you have a saltwater pool handy this works mighty fine - if not a chlorinated pool will also work, as will a bowl/bucket with some table salt dumped in. I like to use an old toothbrush for this. Whatever soap is handy, or no soap if there is none handy. The scrubbing should clean off most of the dry/dirtiness that the soak didn't get but this would also be when you'd trim or clip if you so desire, but this is considerably less socially acceptable, so possibly best saved for when alone. For toes, I love me a nice opalescent shade. I stumbled upon this one from Urban Outfitters in a time of dire need and it's pretty amazing. It's called "Oyster". I will start with 2 coats and then add coats over the subsequent weeks until I can't stand it anymore (usually about 4 weeks) and then I will take it down to the natural nail and start over again. It is also very easy to apply and camouflages chips and smudges like nobodies business. It's the perfect summer neutral. 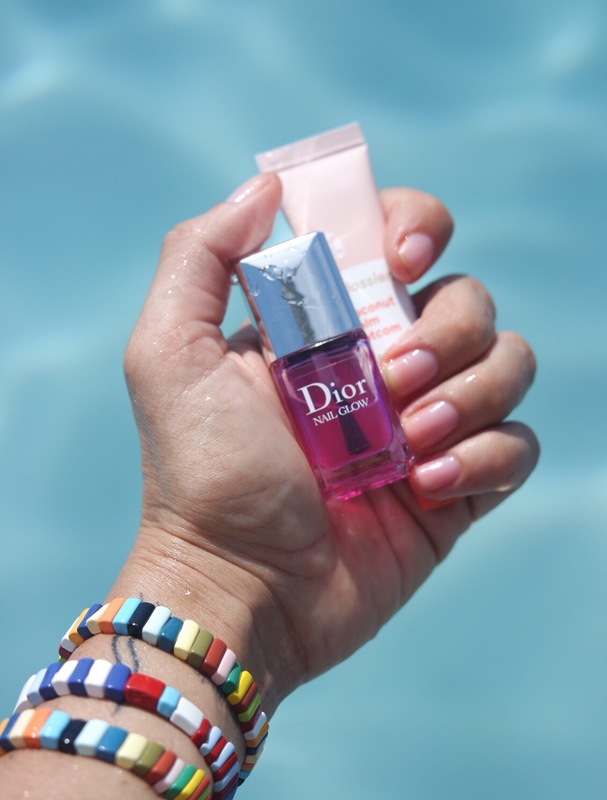 On my fingers I am completely obsessed with the Dior Nail Glow, which claims to just make the pinks pinker and the whites whiter. All I know is I get sooo many compliments on this, it lasts forever. As a summer bonus, only I can tell when it's chipped (and even then I have to really look) and you can literally just slop it onto your nails with very little skill or precision without worrying about looking like a hot mess. Here's where the real magic happens. I love this foot sheet mask**, and this cuticle cream from local Chicago Mojo Spa which smells like heavenly marzipan. Really though, I consider those "nice to haves" - the real essential is the Coconut Balm Dot Com, which I apply lavishly on all cuticles (it also helps prevent smudging!) The mist is just for your face because you're working so hard. **Note: This is not the crazy peeling one that makes your skin come off in clumps, this is just a a sheet mask like for your face to push the serum and moisturize in and keep it from evaporating. Make sure your polish is really dry before you use this one, or use it before you paint and then wash your toenails off so the polish has a clean surface to adhere to. Hands and feet need protection from fine lines and wrinkles, too! This Sunscreen by Drunk Elephant is a treat to use, and the 2015 winner of Allure Best of Beauty. Don't forget open toed shoes (I basically live in these Adidas ones) to show off your toes and protect your soles from the hot concrete.